KUALA LUMPUR (Aug 3): Public Bank Bhd, in which the Employees Provident Fund (EPF) increased its stake over the week, dipped 1.31% on profit taking in the morning session today. At 12.30pm, it fell 26 sen or 1.31% to RM19.54 with 737,900 shares done for a market capitalisation of RM76.5 billion. Interpacific Securities Sdn Bhd remisier Sam Ng said the drop in the stock after a higher opening could be due to profit taking. "This counter is mostly controlled by institutions, so maybe there could be a portfolio reshuffling by fund managers. Investors might have seen an opportunity and resort to taking profit," he told theedgemarkets.com. Meanwhile, the EPF has been gradually increasing its stake since last week to 12.7% or 492.1 million shares in Public Bank, after reducing its shareholdings from 15.4% on Jan 4, 2016. On July 28, Public Bank reported a 5% growth in net profit to RM1.26 billion from RM1.2 billion a year ago for the second quarter ended June 30, 2016 (2QFY16) as a result of higher net interest income and Islamic banking income. Its quarterly revenue rose 6% to RM5.02 billion from RM4.74 billion. 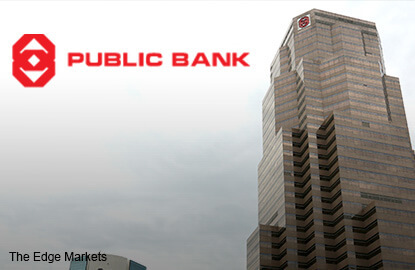 "The improved earnings were mainly due to higher net interest income and income from Islamic banking business, which were partially offset by higher other operating expenses and lower other operating income," Public Bank said. It also declared an interim dividend of 26 sen, amounting to RM1 billion, payable on Aug 22. For the cumulative six-month period (1HFY16), its net profit also grew at 5% to RM2.49 billion from RM2.37 billion a year ago, underpinned by higher net interest income of RM290.5 million, and higher income from Islamic banking business of RM47.3 million. Revenue for the period gained 7.7% to RM10.06 billion from RM9.34 billion.